$10 for adults, $5 for students with ID, 12 and under free. The Quiet Water Symposium, the largest one day show of its type in the nation, celebrates non-motorized outdoor recreation. 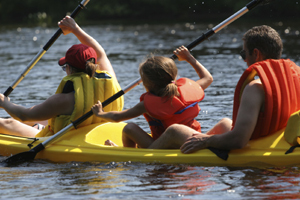 This year’s program will include seminars on paddle sports, bicycling, birding, diving and other outdoor skills. Interactive displays manned by knowledgeable enthusiasts and experts on topics such as wooden boat building, camp cooking, cycling, kayaking and protecting our watersheds and environment will also be featured. Speakers include Cliff Jacobson, Doc Fletcher, Gary and Joanie McGuffin and many other noted authors. Vendors will be available to help you chose the right gear or classes with which to get the proper start. HRWC will be there promoting Huron River recreation and our spring River RoundUp for the Adopt-A-Stream program. Stop by our table for information on our summer fly fishing classes and paddle trips. For more information please visit www.quietwatersymposium.org.